Tips For Scaring Away Halloween Cavities! Every parent wants to protect their child’s teeth from cavities. But with Halloween just around the corner, that’s a little easier said than done! That’s why Dr. Landry and our team at Lapalco Family Dental is sharing today’s blog with you! We’re happy to see your kids twice a year for their dental checkups. We especially love it when their teeth and gums are healthy and strong. With that in mind, we want to do all we can to help! So today, we’re giving you some tips for scaring away cavities this Halloween. We love Halloween just as much as anyone here at Lapalco Family Dental. Kids are always so excited to tell us about the fun costumes they’re going to wear and the candy they get to eat. But this can pose a problem for their teeth. Dr. Landry knows that it’s not realistic to keep candy away from the kiddos, especially during Halloween. So you won’t be reading about abstaining from sugary treats in today’s blog! We just want to help you keep your kids protected from the tooth decay and cavities that too much sugar can cause. Here are some tips for keeping your little ghosts’ and goblins’ smiles healthy this season! The best tip we can give you is this time of year is to remember moderation. Again, we’d never tell you to lock the candy up and throw away the key! That takes all the fun out of the holiday for kids! But you can try to limit how much candy they eat each day. You don’t want to give harmful bacteria in their mouth a buffet of endless sugar to feast on! That’s what leads to the acids and tartar buildup that cause decay and cavities. Some candy is less harmful than others. Sticky candy like taffy and caramel will plant itself on the surface of teeth in the toughest little spots. This makes it even harder to get your teeth and gums thoroughly clean. It’s best to avoid this kind of candy as much as possible. Instead of filling the Halloween candy bowl with those huge gumballs filled with sugar, try sugarless chewing gum instead. For one thing, the constant chewing helps encourage saliva production so your tooth enamel is nice and protected. Sugarless gum also contains, xylitol, a sweetener that research has proven to starve the bacteria in your mouth. Sometimes you get a piece of candy with a stubborn wrapper. But don’t be tempted to use your teeth as tools to open it. You could risk damaging a tooth or harming the enamel in some way. This is a good tip any time of the year. Rinsing your mouth with water after meals, snack, and sweet treats is a great way to keep your mouth clean of particles and debris in between brushing. Just like with sticky candy, you also want to be careful about hard candy. Not only do you have to keep it in your mouth for a long time, exposing it to sugar longer, but your child can also risk biting down and damaging a tooth if they don’t wait for the candy to dissolve. It makes sense, if you don’t want to overindulge on sugary treats, make sure you’re full from a healthy, balanced meal first! Treating Halloween candy like an after-dinner reward than a snack you can graze on all throughout the day is an effective way to maintain moderation. It’s Okay To Indulge Once In Awhile! Halloween should be fun! Dr. Landry and all of us at Lapalco Family Dental want to keep it fun by helping your family avoid problems that might land you in the dental chair for a filling! So indulge a little bit, remember our tips, and have a safe, fun Halloween! You can also call our Marrero dental office at 504-264-6461 today or fill out our online form to schedule a preventive cleaning and exam! 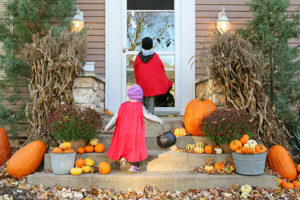 Comments Off on Tips For Scaring Away Halloween Cavities!